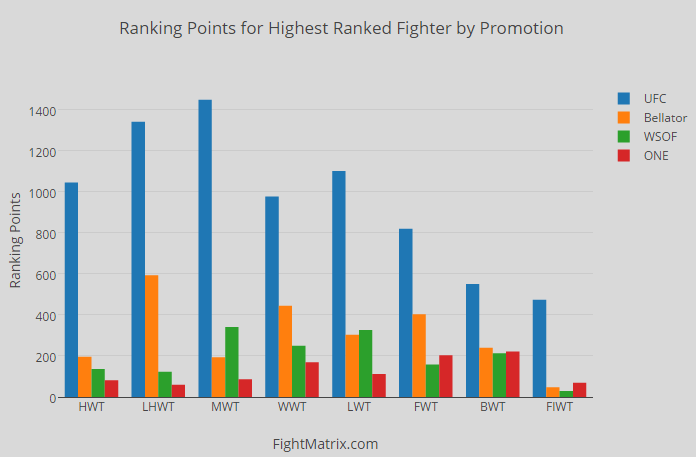 The preceding graph shows the ranking points for the highest ranked fighter for the UFC, Bellator, World Series of Fighting and One Championship in the current rankings release. Ranking points are the result of the FightMatrix computerized rating system and used to determine ranking. In short, the higher number of points means a higher ranking. As you can see, the UFC has the top ranked fighter in all of the listed divisions. #4 Phil Davis has the most points of anyone not in the UFC, and Bellator welterweight champion #9 Andrey Koreshkov is not far behind. Fighters not in the UFC do not always have access to top competition. This can lead to a gradual decline in rankings. #33 Ben Askren has gone undefeated in One Championship, but his ranking points have fallen from 376, when he signed, all the way down to 169. The following list shows the top ranked fighter to have last fought for each promotion. Ranking points are listed in parenthesis.